Day two of my week devoted to Joan Crawford continues with an exploration into mental illness and murder. Possessed starts out with a promising story of obsession and mental instability, but collapses under the heft of a murder mystery and love triangle with a leading man who lacks any necessary flair. The leading ladies are great, and there’s a few set pieces worth watching, but overall the only thing you’ll be possessed by is boredom. After she’s found wandering the streets asking for “David,” Louise Howell (Crawford) recounts her past and her obsessive love for a man named David Sutton (Van Heflin). 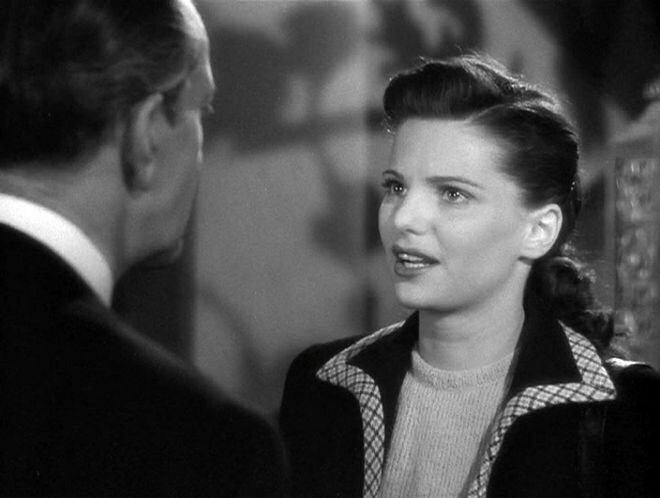 When Louise marries a lonely widower (Raymond Massey) and David’s presence becomes more pronounced, Louise starts to lose her grip on reality. The script, written by Silvia Richards and Ranald MacDougall, leaves the viewers with far too many questions that pop up due to the slamming of the psychological thriller with the murder mystery. There’s too many cooks in the kitchen, with various storylines competing for space. By the end, the entire point of the story is obfuscated leaving the audience bored and confused. For being an hour and forty-eight minutes, there’s not nearly enough plot to maintain the runtime, so you can see the script adding in more elements to keep things progressing. Unfortunately, the answer to that question is never fleshed out well enough. Possessed starts out with promise and is compelling when it focuses on Crawford’s burgeoning schizophrenia. Upon first meeting her, Crawford is weathered, gaunt and utterly defeated. When the scene cuts to Louise pre-hospital you’re shocked to see how well and youthful she is. Has love driven her mad or consumed her? The mystery leading into how she’s ended up here is drawn well for the first thirty minutes, but the actual introduction to David and Louise’s relationship starts with their break-up. There’s no context into their prior relationship. Was it happy? Did David truly tell Louise that their relationship was only for fun? I believed these would be explored through subsequent flashbacks, but the entire relationship is dropped in favor of a hackneyed murder plot. The way it stands you just believe Louise is crazy and David is a jerk. It is apparent that their relationship is one-sided; Louise clutches to David during their kissing scenes. Her desire to have “a monopoly on” him is definitely strange, but there’s no context other than what’s flatly presented. I could understand this being odd if they were together for a week or so, but there’s not even a sentence about how long they’ve been dating! They could have been together for years, which easily explains Louise’s agitation at David not moving forward. The murder mystery, complete with the introduction of the Graham family, feels as if it’s an entirely different movie. The Graham’s are Louise’s employers and the unseen matriarch’s death ushers in a mystery possibly implicating Louise as the killer. It is nice the film parallels Louise’s life, with the unseen Graham matriarch believing that her husband is cheating on her, but I kept waiting for a deceptive twist from a standard film noir only to be disappointed. Possessed ends up being one of those dramas that desperately wants to be a film noir. The saving grace is the gorgeous Geraldine Brooks as Carol Graham. Brooks is breathtaking and the perfect amalgamation of femme fatale and girl next door. Her retorts to Louise are chilling: “I hope you won’t mind if I don’t call you mother.” She’s a younger, brighter version of Louise and when David arrives on the scene and starts courting Carol, it’s a slap in the face to the audience as well as Louise. Speaking of Van Heflin, the script puts him in the worst possible light and Heflin doesn’t add much to the character; he’s smug and a complete leech. Just as Louise puts him in her rear view he unexpectedly pops back up; he goes so far as to show up to her wedding in order to snag free food! I was never completely sure if David’s arrivals were because the plot dictates or if he’s that much of a cad; I’ll go with the latter. Then again, David disappears until the final twenty minutes of the movie, so he could have simply been unnecessary to the plot. There’s simultaneously too much and not enough in Possessed. The combination murder mystery/psychological drama yields varying levels of interest. There are a few intriguing elements within both, as well as two exemplary performances by Joan Crawford and Geraldine Brooks. Unfortunately, the movie’s runtime is encumbered by a lack of proper context and backstory that’s needed to understand the character’s motivations and the deterioration of the relationship that kicks off our story. Possessed is worth watching for the leading ladies, just don’t overthink things. I’ve seen a couple of other lesser-known Joan Crawford films, Autumn Leaves (1956) which I enjoyed. Harriet Craig (1950) I found to be dull and preachy.